The neoprene is a chemically compressed 3mm which means it is for colder water comfort. The outside finish is commonly referred to as “dinahide” is a very durable nylon that has moderate stretchiness. It has exaggerated Kevlar knee pads, BDM brass zipper, a zipper flap, neck dam, and comes with a bag. 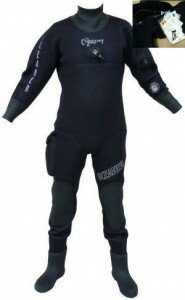 This suit is recommended for Professional Divers and those who commonly dive water below 60 degrees. In summary, this suit is for colder water use and more durable, but has less flexibility than our other suits. Keep in mind; it has much more flexibility than any shell suit on the market as they have no flexibility at all. That is why we stick with neoprene for any diving other than HazMat. Specific size required with shoe size and neck measurement. No extra charge for this extra service! Click the image below for more information on the drysuit features.
" Each "X" above an Xlarge size incurs a 10% additional material charge"